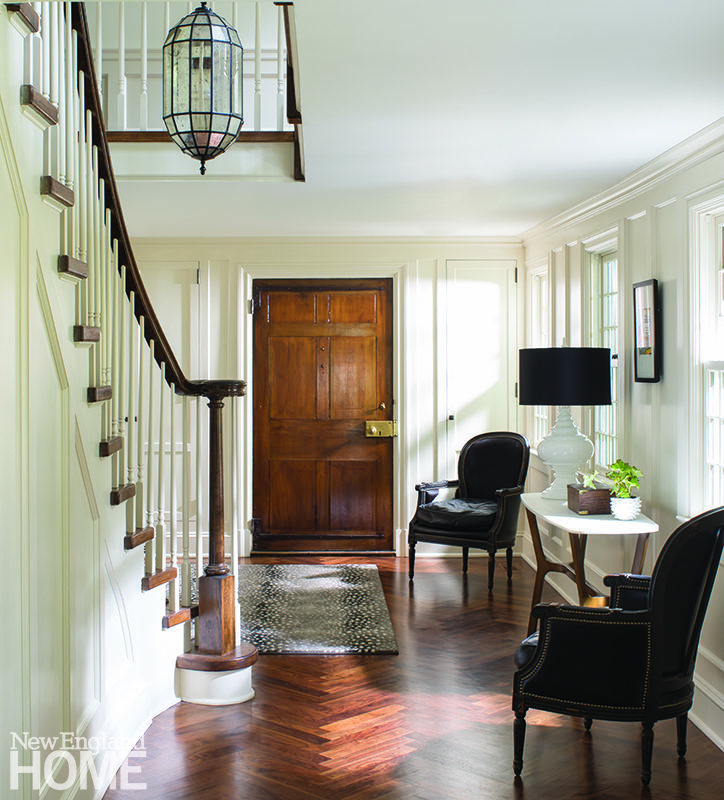 A nineteenth-century Wilton home’s makeover restores its Federal-style provenance. A new tin-roofed wraparound veranda, eyebrow windows, and authentic gaslights from Bevolo of New Orleans add character to the historic home on a hilltop in Wilton. A reclaimed nineteenth-century door opens onto the foyer, construction of which required the removal of an old fireplace and the relocation of a staircase. The living room’s sofas, custom designed by interior designer Gilles Clement, get extra visual interest with built-in shelves at their backs. New and old blend in this backyard view of the home: the original 1826 section of the house is in the middle, flanked by the 1916 addition to the right and the new family room to the left, where a carriage house once stood. The cheerful upstairs office, with walls painted in dramatic Charlotte’s Locks from Farrow & Ball, is functional and fun: the owners run their winery from here when they’re not in California. The cocktail room’s gold paint and drapes brighten the substantial leather furniture and deep teal shelves. Tamara Kalin’s favorite color makes a bold appearance on pillows, throws, and accent pieces in the couple’s bedroom. A balcony was closed in to create the master suite’s chic sitting area. Like a fine wine, some homes mature with age. After nearly two centuries, an in-town residence in Wilton has evolved into a thoroughly modern dwelling while retaining its historic character. Built in 1826 on a four-acre hillside lot with commanding views, the Federal-style house was significantly expanded and made over as a Colonial Revival in the early twentieth century. By 2013, when a friend suggested that Steve and Tamara Kalin take a look at it, the house was beginning to show its age. With two of their six children still living at home, diverse interests, and a love of entertaining, the Kalins found ways to utilize every inch of their 6,434-square-foot house. “The project was more about tailoring what was here to fit their needs than expanding the home,” says architect Kevin Quinlan. Quinlan created a greater sense of symmetry in a structure that had become a bit of a jumble over time, removing a two-story column at one corner of the house and enclosing a balcony to create a pair of walk-in closets for the master bedroom while squaring the exterior proportions of the home. The original main staircase and a fireplace were dismantled to create a new entry off the porch; from the foyer, “view corridors” look past the relocated stairway into the formal living room to the left and through the kitchen to the former carriage house—now a family room—to the right. What’s revealed is a house of distinctive spaces conceived by Tamara and interior designer Gilles Clement. In a city like Clement’s native Paris, for example, it’s not uncommon to live in a building far older than this one, but that doesn’t compel homeowners to emphasize Baroque or Neoclassical flourishes. “It’s a given in Europe to mix periods and styles,” the designer says. The family room—the only new construction—is one of those high-ceilinged areas, a relaxed and playful space that includes a bonus loft that serves as a reading nook. As with most spaces in the home, it can accommodate large numbers of people, from the couple’s children to a gathering of their own friends. In another house, a masculine room with bookshelves painted deep teal, leather furniture, and gold drapes might properly be called a study or library, but in this case, a hidden wet bar in the corner explains the Kalins’ preferred moniker: the “cocktail room.” Clement employed gold accents, in the drapes and in the paint at the back of the bookshelves, to soften the transition to the adjoining living room. Shades of white and gray predominate throughout the house, but splashes of orange add spark, from the toss pillows in several rooms to the eye-popping walls of Tamara’s second-floor office. In the kitchen, an appliance enclosure Smith designed and built to resemble an antique ice chest similarly enlivens the muted palette. A sleeping porch off the master bedroom was enclosed and repurposed as a sitting room with the addition of a hipped roof with a beamed tray ceiling, which continues into the master bathroom, where a soaking tub provides a relaxed perspective on the manicured yard and gardens through a pair of oversize windows. The grounds were cleared to reveal the original stonework terraces, and Tamara enlisted the help of the Wilton Garden Club to restore the formal gardens and lawns to the rear of the house. A new pool blends easily into the landscape, with a bluestone patio that flows around one of the property’s ancient trees and makes a favorite spot for sipping wine with friends on warm summer evenings. This article appeared in the Winter 2018 issue of New England Home Connecticut with the headline: A Fine Vintage.